I agree with all of his arguments with the exception of one point. As I came to read more and more material from that era, I must disagree with him on the aspect of what the ANC fought for. 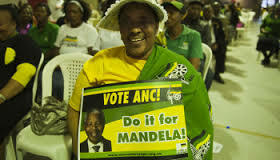 It would seem that they did not fight for a free and democratic society, but that this “free and democratic” aspect only came about due to the compromises and concessions made at the Convention for a Democratic South Africa (CODESA). Instead, the ANC fought for a Marxist socialist state, as envisioned in the “Freedom” Charter, with black majority rule. So rather than fighting for a society in which individuals could excel and aspire to more than the status quo allows, the African NP (as I have come to name them, on occasion) wanted a collectivist state based on the rule by a group with the most members of a particular skin color, not unlike the Afrikaner NP (National Party) which created and enforced Apartheid. I caution against viewing the ANC as our saviors in any regard. They, along with all the other Black Nationalist organizations, played a big role; but they did not play the biggest or indeed the most constructive, role. We must realize and acknowledge that during the CODESA negotiations, the Afrikaner NP, the Democratic Party and the Free Market Foundation had to stonewall the ANC on many fronts. In fact, the Free Market Foundation itself played a big part in qualifying the controversial “limitations clause” (section 36) in our Constitution. A limitation on the rights of individual South Africans can only occur if it is justifiable in an open and democratic society, based on freedom, equality and human dignity. One may not immediately realize the significance of this, but that small line provides much protection against Zimbabwe-esque land seizures and censorship of our ever-critical media, among other things. The limitations clause in general, as I consider it, reduces our bill of rights to mere political lip service, and in essence, says that no individual has any rights outside of South Africa’s quest toward a collectivist socialist state where everyone is economically equal. This outcome based “equality” program is an affront to freedom, as has been shown. It places the right of every individual to live and trade freely as secondary to the alleged “national aspiration” of South Africa’s unachievable journey toward fantastic equality. It is therefore that I say the ANC must not be regarded as the liberator of South Africa, since South Africa, even now, is not “liberated”. As our economic health continues to shrink, our ANC government is edging ever closer to their ultimate dream of a socialist South Africa. At their birthday celebrations, the President, Jacob Zuma, spoke again of how government must within this year create legislation which would provide for land seizures (cloaked under the noble title of “land reform”). The rising cost of college education, too, he says, marginalizes and excludes the poor; himself forgetting that all of South Africa’s large universities are mostly funded by the taxpayer. This is not an unknown tactic – the government making the failure of socialist policy, seem like the failure of free market forces. We must also not forget the ANC’s planned national minimum wage policy, which will most likely see the rate of unemployment increase with an already-unpopular and untrustworthy labor force. The threat of a paternal government which may at any moment pounce on the dreams, goals and interests of individual South Africans is ever present; a threat which since the end of Apartheid has not died away. 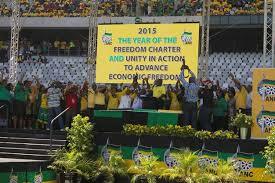 We celebrated our so called “20th year of freedom” in 2014, marking 20 years since the formal end of Apartheid. I believe we must ask ourselves, how ‘free’ are we really? As a third year law student and someone who is quite observant of how government interferes and supervises our lives, I believe we can only barely call ourselves a free society. We are tethering on the edge of becoming another unfortunate case of socialism destroying an African country.